Improve your day-to-day performance with the Dell Premier Wireless Mouse - WM527. 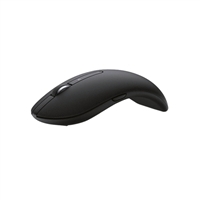 Easily navigate on almost any surface, including glass and high-gloss surfaces with the 1600 dpi laser mouse. With the choice of wireless connectivity, you can easily switch between three devices-desktop, laptop, and mobile devices-using 2.4GHz wireless or Bluetooth LE.